I don’t get how anyone could do that to be honest. I don’t understand how someone gives Madoff all of their money to manage for them. When someone has very little to lose, I totally get betting it all and going for it. But when you have accumulated a nest egg or more, you must be diversified in your investments and assets. 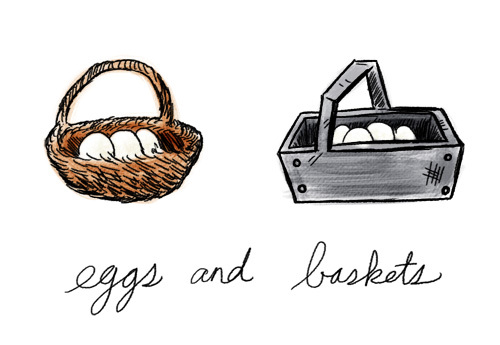 You cannot put all of your eggs in one basket. Last week on MBA Mondays, we talked about Risk and Return. I made the point that risk and return are correlated. If you want to make higher returns, you must take on higher risk. But you can mitigate that risk by diversification. And this post is about that strategy. One of the things most everyone learns in business school is portfolio theory (that’s a wikipedia link if you want to learn more). Portfolio theory says that you can maximize return and minimize risk by building a portfolio of assets whose returns are not correlated with each other. Let’s use some real life examples. Let’s say you have a portfolio of stocks and all of them are tech companies. To some degree, they are all correlated. When the tech bubble blew up in March of 2000, every tech stock went down. So if you had that portfolio, your portfolio went down big. Let’s say you have a portfolio that has some tech stocks, some oil stocks, some packaged goods stocks, some real estate, some bonds, and some cash in it. When the tech bubble bursts, you get hit, but your portfolio does not “blow up.” That is the power of diversification at work. I have my own tech bubble story that is similar to that example. When the Gotham Gal and I moved back to NYC in the late 90s, we bought a large piece of real estate in lower manhattan from NYU. We sold a big slug of Yahoo stock that we got in the sale of Geocities to fund the purchase. And then we sold another big slug of Yahoo stock to fund a complete renovation of that real estate. Beyond those two sales, we did not get liquid on most of our internet and tech stocks because our funds were locked up on almost everything else. When the bubble burst, our net worth dropped 80% to 90%. But it could have dropped 100%. That real estate did not drop in price. It actually increased by 2.5x over the eight years we owned it. That is the power of diversification at work. Of course, we learned our lesson from that experience. We now have a fairly diversified portfolio of assets that includes venture capital investments, real estate investments, hedge funds, and municipal bonds. I am not suggesting that our mix is a good mix. I suspect we could be much more conservative and more “efficient” with our asset allocation if we hired a professional financial planner to do this work for us. But this post is not really about our portfolio construction or even about asset allocation. It is about the power of diversification as a risk mitigator. Let’s talk about diversification in venture capital funds. Making “one off” early stage venture capital investments is a bad idea. The chance that you will pick a winner in early stage venture capital is about one in three. I’ve said many times on this blog that one third of our investments will not work out at all, one third will work but will not be interesting investments. And all of our returns will come from the one third that actually work out. If you are making “one off” early stage investments and make five or six investments over the course of a few years, you do not have enough diversification. You could easily pick five or six investments and not once get to the one third that work. We put 21 investments into our 2004 fund and I believe we will put between 20 and 25 investments into our 2008 fund. With that number of investments, we have a good chance of finding one investment that will be good enough to return the entire fund. And we have a good chance of finding another four or five investments that will return the fund again. We can handle a complete wipe out on between five and ten investments and still produce excellent returns. That is how diversification helps to manage risk in an early stage venture portfolio. So if you are building a portfolio of anything, be it financial assets or anything, make sure to fill it with things that are not too similar and not too correlated with each other. To do otherwise is not prudent. Theories of diversification are worthy of discussion and it is difficult to find fault with any comment which argues for a bit of safety amongst one’s investments whether through diversification or othewise. I think the real issue is not so much “diversification” amongst individual securities but rather diversification amongst categories of assets and whether they are lifestyle investments or financial investments. A general note of caution — never, ever, ever comingle or mix your business risks/investments with your personal risks/investments/stuff. Make damn sure that you have a Chinese wall and lots of Chinamen between what you do at the office and what you do at home. It is perfectly reasonable to compartmentalize your business risks in such a manner that you are using OPM in your business endeavors (even if you co-invest w/ your own funds after you’ve made a few trips to the pay window yourself) and keeping your own net worth guarded from business risks. In looking at one’s personal balance sheet there is an opportunity to “fully fund” specific elements of your life and to then take the inherent risk of a setback changing your own personal lifestyle for the worse out of the equation. To have no debt on your house in a state in which homestead laws may protect you from business creditors is such an example. To own your basic “stuff” free and clear is another example. I also argue for “paying yourself first” in every instance in which money changes hands (including payday if you have such a wonderful ocassion in your life regularly). Don’t wait until you are 65 to start thinking about how you will pay for the rest of your life. Start SAVING at 20 and keep saving for the rest of your life. Put those funds in the safest possible type of financial investments. I must make a general plea to consider real estate as a critical part of your personal long term investment strategy. It is tangible. It rarely drops to zero value. It can generate meaningful cash flow while capturing the impact of inflation. It is easily leveraged and borrowings are not a taxable event. It can be increased in value by sweat equity and you can inject sweat equity at your own schedule. This article was originally written by Fred Wilson on June 21, 2010 here.